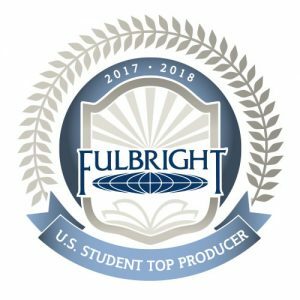 TUSCALOOSA — The University of Alabama has once again been recognized as a top producing institution for Fulbright U.S. Student Awards, according to The Chronicle of Higher Education, making UA the leader in the Southeastern Conference. Fifteen of 47 UA applicants received the award for 2017–2018, one of the highest winning percentages in the nation. This is the second time in the past three years UA has been recognized as a top Fulbright U.S. Student Program producer. The Fulbright U.S. Student Program offers grants for independent study and research and for English teaching assistantships overseas. The highly competitive program selects approximately 1,500 award recipients from more than 10,000 applicants each year. Ten UA graduates won awards as teaching assistants, and five UA graduates received Fulbright awards for research and study for the 2017–2018 academic year. University of Alabama graduates serving abroad on Fulbright Awards are Ruth Bishop (Colombia), Erica Boden (Bulgaria), Benjamin Canady (South Korea), Kathryn “Katie” Cater (Poland), Kelsey Daugherty (Germany), Brittany Groves (Germany), Jonathan Joyner (Sri Lanka), Jackson Knappen (Spain), Alexandra LeViness (Germany), Julia Quan (Macedonia), Charlotte Sheridan (Jordan), Ann Varnedoe (Spain), Sarah Dylan Walker (Macau), Kevin Ryan Williams (United Kingdom) and Emily Zapinski (Malaysia). Other top producers among research institutions this year include Brown (39), Michigan (25), Harvard (24), Texas-Austin (20), Tulane (15), Yale (13), Virginia (12), Duke and Emory (11), and UNC-Chapel Hill (10). For the full list of top student Fulbright program producers, see https://www.chronicle.com/article/Top-Producers-of-Fulbright/242557. Students interested in applying for next year’s Fulbright program can learn more at international.ua.edu and us.fulbrightonline.org, or by sending an email to beverly.hawk@ua.edu. The Fulbright competition is administered at the UA through the Capstone International Center, 135 B.B. Comer Hall. A recognition luncheon and information session will take place Thursday, Feb. 22 from 11:30 a.m. to 1 p.m. in Capital Hall on the UA campus. Lunch will be provided and all are welcome. There is no charge. The event will recognize Fulbright alumni, welcome Fulbright visitors and encourage new Fulbright applicants. Fulbright Award winners will share their Fulbright experiences. Representatives from the Capstone International Center, as well as UA scholarship officials and members of the Global Café Fulbright Advising Initiative will be present. Parking passes for the event will be available at the Capital Hall front desk.